Some recent developments in research, equipment and practical applications are reviewed together with on-going activities. The last NDT-CE conference to be held in the UK was in 1997, and attention is focused on the period since that event. Techniques include subsurface radar, dynamic response, acoustic emission, electrochemical reinforcement corrosion assessment, ultrasonics, chloride detection, magnetic imaging and soils performance, together with pull-out and maturity insitu concrete early age strength estimation. Dissemination of research to industry is considered, including the role of the British Institute of NDT and other organisations such as the Concrete Society and Highways Agency. Potential future trends are noted both in the UK and broader international context. The full scope of NDT activity in the UK within the Civil Engineering industry was reviewed at the NDT-CE conference held in Tokyo in 2000 . Areas considered included assessment of ground conditions and location of buried features, testing of highway and airfield pavements, structural integrity (both overall and localised) and materials properties using numerous different techniques. In general, the wide-ranging activity identified at that time continues, whilst this report focuses upon a number of areas in which there have been particular recent developments. A selection of recent and ongoing research projects are identified which have either resulted in commercial application, or offer particular promise. Equipment developments and availability for practical field applications are similarly reported in relation to industrial usage of NDT. The current situation for support of NDT research and industrial dissemination of results is also considered in the context of recent and ongoing activity and future trends. Some of the activity and developments are reported in other papers presented to this conference, and these should be consulted for more detailed information in such cases. 'PUNDIT PLUS' - which is a new generation, microprocessor-based, development of the long-established PUNDIT ultrasonic tester widely used on concrete, now offering data storage facilities . New sub-surface radar equipment for testing concrete structures offering improved portability, and higher frequency antennas with improved performance characteristics. New hand-held 4-probe resistivity test equipment for concrete structures, with automatic data storage. Acoustic-Emission (AE) equipment suitable for routine field use, including one system developed in the UK. Improved covermeters, including a 'borehole probe' device. Improved radiography systems including reductions in size and increased energy levels, together with better image capture and processing as well as safety features (eg 'MEGASCAN [TM]'). Laser-based surface strain and pavement deformation measuring devices. Several specialist test companies have also successfully developed equipment configurations and software for use in specific situations for example, multiple radar antenna arrays for highway surveys. Another interesting example is the 'TERRIG' system  for determining the bearing capacity of material below existing concrete ground-slabs based on load/deflection measurements as illustrated in figure 1. This is particularly useful when an assessment of floor capacity is needed relating to change of use. Fig 1: The 'TERRIG' System . These improvements in availability and performance of equipment have all led to enhanced field usage of the techniques and helped to improve awareness of the potential benefits to be gained from non-destructive testing within the civil engineering community. In considering research and development activity, it is perhaps useful to examine the principal mechanisms for funding, undertaking the work, and dissemination of results. These have been outlined in Figure 2 which shows the key interactions between Government, Industry, Professional organisations, Research organisations and Universities. Direct government funding, channelled in some cases through bodies such as the Highways Agency (responsible for Motorway Bridges), tends to focus on short to medium term projects relating to a clear industrial need - often with a strong review and developmental content. An example of this is the wide ranging work on NDT methods applied to masonry structures, as well as post-tensioned concrete, undertaken at the University of Edinburgh over recent years. Much of this work is undertaken by industrial research organisations, possibly with some specialised university input, and perhaps also with industrial financial contributions. The Cardington European Concrete Building project is a good example, with work undertaken by the University of Liverpool and Queens University, Belfast on early-age insitu concrete strength assessment using maturity and pull-out methods as part of a wider range of overall activity managed by the Building Research Establishment (BRE). This has led to a Technical Report  published through the BRE as well as Best Practice Guides for industry. Research Council (eg Engineering and Physical Science Research Council - EPSRC) and EU funding tends to focus on more basic research activity, usually with strong industrial collaboration and input. In this case, development into commercially usable systems is undertaken by industry - sometimes in the form of spin-off exploitation companies. Examples here include work at Imperial College on ultrasonic testing of rock bolts, and at Queens University, Belfast on insitu concrete strength and permeability testing methods. An important new development is the recent establishment of the EPSRC supported Research Centre for NDE (see Figure 2). This is led by Imperial College and Strathclyde University and involves several other Universities, with major industrial input to support activity ranging from longer-term strategic core research to short-term industrial technology solutions. This will seek to provide improved coordination of NDE research and increased University/Industry collaboration. The total funding over the next few years will be substantial, but the scale of Civil Engineering activity to be included is unclear at present, and may be relatively small. Fig 2: Outline of support for research and dissemination. In-house industrial research tends to focus on development of particular systems or procedures (including software) for direct commercial use, with dissemination limited to a marketing role. In all other areas however, industrial-level dissemination and technology transfer is promoted by bodies such as the British Institute of NDT and the Concrete Society through technical journals, conferences, seminars, guidance notes and technical reports. In some cases, these include research-level dissemination, although specialist international conferences and scientific journals are the primary route for this activity, often supplementing industrial dissemination. It is convenient to consider this in terms of technique rather than application. International trends over the preceding four-year period were reviewed in 1997 , and it is interesting to note that subsequent activity in the UK has continued to reflect many of these. In particular, new interests focus on assessment of sub-surface integrity and monitoring, rather than insitu strength (apart from early age development), although prediction of future performance is an important issue. There has also been increased activity relating to masonry structures and railway track-beds in response to national concerns. Load testing of masonry arches. This has been possible as a result of improved instrumentation and the ability to isolate traffic and other environmental noise from genuine acoustic emission sources. Much of this has been stimulated by research on steel structures at Cardiff University, but it is known that there is current research activity on reinforced concrete and masonry at Loughborough and Edinburgh Universities including use for corrosion monitoring. Antenna performance characterisation including coupling effects, antenna development for measurement of insitu concrete dielectric properties taking account of moisture gradients, and development of neural networks for reinforcing bar identification (University of Liverpool). 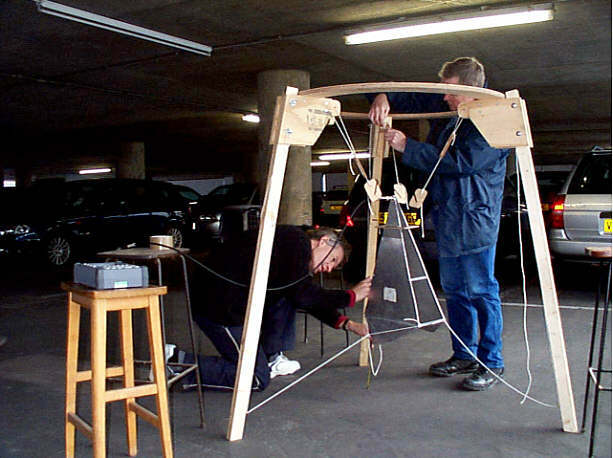 Fig 3: Site trials of Horn Antenna. The work on insitu dielectric property assessment is described in more detail elsewhere in this Conference and utilises a horn antenna operating in the frequency domain with an inversion/optimisation routine to reconstruct the dielectric profile of the material tested . This has been validated on simple layered materials in the laboratory, and is shown in Figure 3 during site trials on a car-park structure using a portable network-analyser system. Inspection of masonry structures, including use of tomography, and non-metallic ducts in post-tensioned concrete; signal velocity assessment in materials (University of Edinburgh). 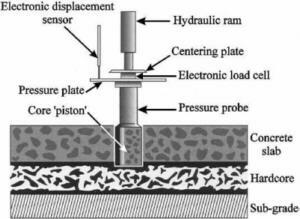 Assessment of depth of surface cracking in flexible highway pavement using high frequency systems (Transport Research Laboratory). Characterisation of railway track-bed ballast (Transport Research Laboratory [TRL] and University of Edinburgh, Aperio). Other ongoing research activity includes participation in the EU SMARTRAD programme within which the Building Research Establishment is developing processing software to improve interpretation capabilities. It should be noted that many examples of practical use recognise the advantages of combination with other techniques such as thermography or in some cases, such as tunnel inspections, with ground conductivity. High frequency 'Guided wave' techniques  have been very successfully applied to testing steel rock bolts as illustrated in Figure 4 and has been developed commercially as noted above. In coal mines bolts are typically about 20mm diameter and up to 3m length, with testing aimed at detecting fractures and major defects. Minimising leakage of the energy into the surrounding rock is crucial to success, with curvature effects causing particular problems. Efforts are being made by the same group at Imperial College to apply the guided wave technique to inspection of rails and, using arrays, to large steel plate structures such as storage tanks. Work with guided acoustic waves has also shown promise in detecting leakage of metallic water pipes from the effects on signal propagation of the surrounding soil properties. Fig 4: Guided wave ultrasonic testing of rock bolts . Other developments continue at an experimental stage to produce improved one-sided pulse-echo transducers and signal processing for use on concrete (in collaboration with German partners) with penetration depths up to 1m . Air-coupled through transmission transducers are also under development at Warwick University. In both cases, use is made of multi-frequency 'chirp' technology. Laboratory studies at University of Manchester Institute of Science & Technology (UMIST) using inductive magnetic imaging systems to locate embedded reinforcing bars have been underway for some years. Recent work, which has a strong signal processing emphasis including use of Synthetic Aperture Focussing Techniques, includes detection of bar surface corrosion  and procedures to speed-up the process prior to commercialisation for field use. Work at Liverpool and Heriot-Watt Universities using electrochemical techniques such as Linear Polarisation Resistance coupled with weight-loss measurements continues to try to predict future lifetime performance where corrosion is present, whilst TRL are concerned with risk assessment for bridges. Work on moisture and chloride movement in cover zones using embedded sensors is also underway at Belfast and Heriot-Watt Universities . Seismic cross-hole methods using tomography to detect disturbed ground beneath foundations have been reported  by the British Geological Survey, whilst other similar work using ultrasonics is reported at this conference. Efforts have also been made to characterise physical characteristics of rail-track ballast from impact tests and continuous surface wave measurements (Napier University) whilst modal wave detection of bridge damage is known to be underway at Bristol University. Alongside these, and other, projects has been an increasing interest in the use of uncertainty methods in the analysis of test results, with one test company  providing a confidence rating according to circumstances. The need for 'whole systems planning' to avoid fragmentation of inspection and testing responsibilities and the consequent dangers of poor performance and communication, is increasingly recognised  and is an important worldwide issue. The crucial role of dissemination of research activity and industrial experience through authoritative guidance documentation was highlighted by the Author in 1997 . This reflected the importance placed by Schickert  in 1995 upon transfer of research into practical applications as the key to future NDT success, and by Carino  upon 'standardisation' as being as vital as research. Carino noted the under-funding of such activity, and this situation remains, however there have been some significant developments. The Concrete Society published a major Technical Report on radar testing of concrete in 1997  and have recently produced a series of Current Practice Sheets dealing with Half-Cell Potential, Resistivity, and Linear Polarisation  testing for reinforcement corrosion. A more substantive report covering these techniques as well as chloride and carbonation measurement is in preparation. The Concrete Bridge Development Group has published a Guide to Durability Monitoring  encompassing a wide range of NDT methods and the Highways Agency is developing a set of Guidance Notes on NDT. The initial parts of this latter document are nearing completion and deal with testing masonry arches using techniques such as radar, pulse echo and conductivity, including tomographic methods. Also included are post-tensioned concrete beams using impact-echo and ultrasonic tomography. These documents will include guidance on specification and commissioning of surveys. Other industrial dissemination has included seminars and meetings organised both by professional organisations (see Figure 2) and specialist companies to increase awareness of capabilities. 'Standardisation' activity has focussed on European Standards, which in some cases are scheduled to replace relevant British Standards in the near future. The British Institute of NDT has included a Civil Engineering session in the programme of their annual conference in recent years, whilst their journal 'INSIGHT' also features an annual Civil Engineering issue. They are also considering the establishment of a Building/Civil special interest group and a register of test companies. The biennial UK-based International Conference on Structural Faults and Repair continues to feature a substantial number of NDT papers whilst international journals such as NDT & E International, and Construction and Building Materials, often contain output from UK research. No attempt has been made to provide a fully comprehensive account of all NDT activity in the UK which is related to Civil Engineering. The examples identified do however reflect the principal areas of activity, including ongoing work. Funding for basic work in Universities in this field is increasingly difficult to obtain and it is to be expected that future activity will tend more and more be in the form of development work by industrial research organisations and industry itself. The need for education of the wider industrial community of the capabilities and potential for NDT and its management will however continue worldwide. Thanks are due to many Engineers and researchers in the UK for information incorporated in this paper, including Dr S G Millard of Liverpool University, and to EPSRC for financial support (Grant Ref GR/N 34130/01). Bungey JH. 'Non-destructive testing in the UK', Proc. NDTCE-2000, ed. T. Uomoto, Elsevier, 2000, 41-49. The 'Terrig' System, Kontrad Assoc. Ltd, Sale, Cheshire, Publicity literature. Bungey et al. 'A radical redesign of the concrete frame process - Task 6 Early age acceptance of concrete' BRE Tech Rep 387, CRC, 2000, 94p. Bungey JH. 'The future for NDT in Civil Engineering', Proc. Int. Conf. Non-destructive testing in Civil Engineering, ed. J Bungey, Brit. Inst. NDT, 1997, 69-76. Watson JR, Holford KM and Davies AW. 'BoxMAP - non-invasive detection of cracks in steel box girders', 4th Int. Conf. on Bridge Management, University of Surrey, April 2000, 8p. Cullington DW et al. Continuous acoustic monitoring of grouted post-tensioned concrete bridges, NDT & E International, Vol 34, No 2, 2001, 95-105. Millard et al. 'A wide band system for measuring the dielectric properties of concrete', GPR2002 - Proc. SPIE4758, Bellingham, USA, 2002, 416-421. Beard MD, Lowe MJS and Cawley P. 'Inspection of rock bolts using guided ultrasonic waves'. Review of Progress in QNDE, eds. DO Thompson and D E Chimenti, Amer. Inst. Physics, Proc 557, Vol 20, 2001, 1156-1163. Miller G et al. 'Detection and imaging surface corrosion on steel reinforcing bars using a phase-sensitive inductive sensor intended for use with concrete'. NDT & E International, Vol 36, No 1, 2003, 19-26. Chrisp TM et al. 'Depth related variation in conductivity to study cover zone concrete during wetting and drying'. Cement and Concrete Composites, Vol 24, No 5, 2002, 415-426. Jackson PD et al. 'Cross-hole seismic measurements for detection of disturbed ground beneath existing structures'. NDT & E International, Vol 34, No 2, 2001, 155-162. Edwards GR. 'A whole systems approach to best practice in NDT'. Proc. NDT 2002, Brit. Inst. NDT, 2002, 240-246. Schickert G. 'A concluding review', Proc. Int. Symp. NDT-CE, ed G Schickert and H Wiggenhauser, DGZfP, Vol 1, 1995, 757-776. Carino NJ. 'Non-destructive testing of concrete - History and Challenges', SP-144, American Concrete Institute, 1994, 623-678. Concrete Society. 'Guidance on Radar Testing of Concrete', Tech. Rep. 48, Concrete Society, Slough, 1997. Concrete Society/Inst. of Corrosion. Current Practice Sheets 120, 128, 132, Concrete, July 2000, February 2002 and March 2003. Concrete Bridge Development Group. 'Guide to Testing and Monitoring the Durability of Concrete Structures', Tech. Guide No 2, Concrete Bridge Development Group, Crowthorne, 2002.